Here you will see your current MYC Portal Software Version, we will periodically release updates so you'll be noticed to update your software when an update is released, in this screen, you will see the "Update" button. Simply press the "Update" button to update your Portal, this will start the automatic update process, that will download the newest sources from our servers and replace all the software core files with the most updated version, at the end of the process the page will be reloaded automatically and you'll have your software updated! For security reason, the update process will save a full backup of your portal root directory in the folder PORTAL_ROOT/backups before applying the new update that may override your old files. 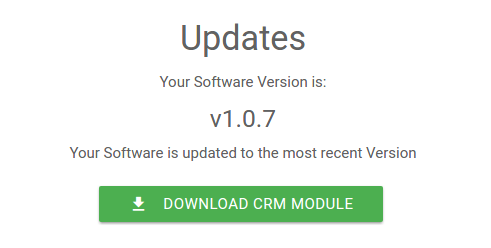 In this section you will also find the button Download CRM Module, clicking on it you'll get the most updated sources of the installable MYC Portal Extension for your CRM, we really encourage you to update your CRM extension after each portal update. Here you will be able to check your license status then Deactivate it or Re-Activate in case you deactivated it before, each time you will put a license key the system will check if it's valid or not and which kind of license you inserted, then will automatically update the software sources if needed.